It feels like the end of an era. 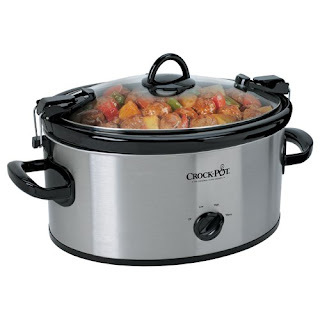 My trusty old Crock Pot has finally bit the dust. I don't know exactly what happened, but this morning while putting it away I noticed a hairline crack extending clear across the bottom of the heavy ceramic bowl and up the side. The crack may have been there for some time, and might even be perfectly harmless, but I'm not particularly inclined to continue using it in its present state. It had been on a bit of a slow decline for a while now. A couple of years ago I made the mistake of putting the lid in the dishwasher, causing the knob to warp. Then the screw that held the (still somewhat functional) warped knob in place, removed for cleaning, went into the garbage disposal, thus dispensing with any further use of the knob. This was provided an unexpected improvement in the form of a steam vent, via the now permanently exposed hole in the lid. I used it this way for a while, until I dropped and shattered the glass lid, sometime earlier this year. After that I was using a salad-sized plate for a lid, but now, finally, it's time for a whole new unit. The Crock Pot was a gift from my mom in the early 2000's. I used it only occasionally before going paleo. After that transition, it became an indispensable part of my kitchen arsenal, and throughout 2011 it got its heaviest workout ever. At the beginning of that year, I used it to make lots of tendon stew and bone broths while I was recovering from surgery on a tendon in my left hand. Later that fall, it ran nearly constantly, stewing up pig feet, which were the only thing I could get my dear old hound Todd to eat in his final stages of terminal cancer. I nearly threw it out after that, but in time the unpleasant associations with that episode faded to where I could make use of it once again, without being upset by it. And so now, having properly eulogized my cherished slow cooker, it goes off to the rubbish bin, to be returned to the earth whence its raw materials originated. I will toss it into the black bin with a salute of "Thank Capitalism" in my heart. I suspect I'll end up with the Hamilton Beach, even though it seems like a betrayal to not stick with the Rival Crock Pot brand. 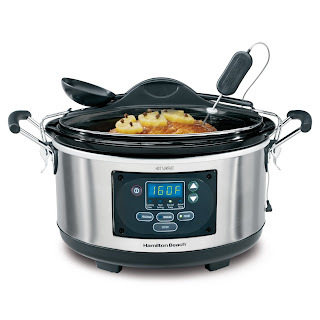 I like that it's programmable, with start time and stop time; it has a warming mode to keep your dinner hot without overcooking it; and I really like the temperature probe for roasts and such. All that for fifty bucks seems like a pretty good deal, and Rival doesn't have one with the temperature probe at all, that I can find. 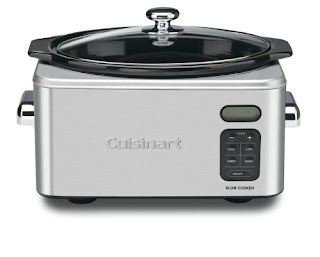 The Cuisinart looks great (a very important consideration in my household), but has almost half as many 1-star reviews on Amazon as it has 5-star reviews, and that's a terrible ratio. Thankfully, I had just finished a big batch of carnitas when the crack was discovered. I should be up and running with the new 'Pot by next week. As sad as I am to see the old Crock Pot go, I recently discovered nirvana in the form of braised lamb shanks (at the Elephant Bar in Burbank), and can't wait to get my hands on my new, bigger, programmable, temperature-probing slow cooker and give them a try at home! Thus, the end of an era, and the beginning of a new one.